It seems such a shame that Gotham is about to call it a day given how generally good I Am Bane is. You have a legendary figure from the Batman mythos, some surprising twists and turns, tender moments and even a bit of levity. Yes, there are things in I Am Bane that I wasn't overwhelmed with but on the whole it looks like Gotham will end on a high note. Things are finally looking up for Captain Jim Gordon (Ben McKenzie). Not only is reunification with the mainland about to succeed, but he is weeks if not days away from being a father. Granted, the mother is not his wife Lee Thompkins (Morena Baccarin) but his one-night stand Barbara Kean (Erin Richards), but why be picky? Unfortunately for him, a new threat has come when Gordon's newest nemesis Eduardo Dorrance is now stalking the streets under orders from 'Secretary Walker' to take Gordon, Bruce Wayne (David Mazouz) and General Wade (John Bedford Lloyd). Bonkers Babs for her part has her own ideas however. She is about to join her frenemies Oswald Cobblepot aka Penguin (Robin Lord Taylor) and Edward Nygma aka The Riddler (Cory Michael Smith) on their submarine when her contractions start. Pengy & Riddler were going to leave her behind but she took a major part of their sub, forcing them to find her. Bonkers Babs is pretty much the woman of the hour, for I Am Bane centers around everyone finding her. We learn that 'Secretary Walker' is really Nyssa al Ghul (Jaime Murray), daughter of Ra's al Ghul who now wants revenge on both Bruce and Gotham as a whole. Nyssa's revenge involves psychological torture on Bruce and getting her mad scientist Hugo Strange (B.D. Wong) to reprogram Wade and Gordon for her own nefarious schemes. To complete her vengeance, Nyssa needs to kill Barbara so she sends Bane, with both of them uninterested that Barbara is going into labor. Pengy and Riddler are forced to join forces with Bonkers Babs to keep her alive, but they have a few tricks up their own sleeves. Barbara gives birth to a girl, but Nyssa will not be denied. Bane is halted by Alfred (Sean Pertwee) and Selina Kyle (Camren Bicondova) but Alfred gets a brutal Bane beating. For their part, after a daring escape General Wade issues "Special Order 386": the bombing of Gotham into oblivion, as he is under Nyssa's control. I Am Bane curiously has as its weak point Bane himself. Perhaps I still cannot accept Shane West as this nearly-unstoppable massive force. As much as I would like to not think on it, West cannot match Tom Hardy's take on the character from The Dark Knight Rises. West isn't as massive physically as Hardy was, but West's weakness comes from more than not matching Hardy's massive bulk. Even with just his eyebrows West somehow manages to overact, making Bane almost amusing. Same goes for Murray's Nyssa, who has that 'female villainess as slightly campy character', all cooing her lines. Give I Am Bane credit though for some spectacular moments and camera work. The opening is visually arresting when we see Strange create Bane. There's Bane's arrival at the Gotham City Police Headquarters, almost cinematic. The most outlandish yet fascinating is when Barbara managing to shoot her way out of the hospital while being wheeled out screaming in labor pains, down to giving us Bonkers Babs point-of-view. The script also manages to fold all the plots into themselves very well. So many agendas and plots going on and I Am Bane manages to hold them well. Again, West is still not Bane to me. I'm also not convinced that General Wade could not have come to blow up Gotham on his own volition. After all, he was kidnapped and that is prone to make anyone give up on thinking that Gotham is safe. I Am Bane also kept Bicondova's Selina to almost observer. However, so much of I Am Bane went right why obsess on what was not great. With only two episodes left it seems that I Am Bane might be anticlimactic but through no fault of its own. 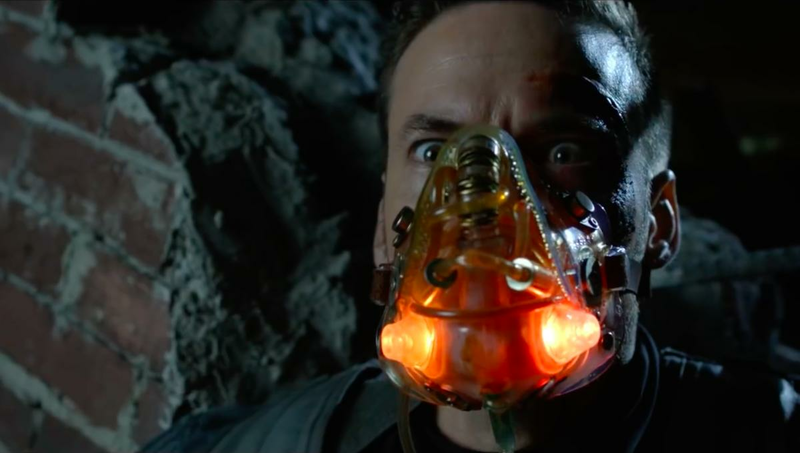 Still, I Am Bane is a strong episode to start shutting down a series that sadly did not reach its full potential. Next Episode: They Did What?